Marc Zakharovich Chagall (born Moishe Zakharovich Shagal; 6 July 1887 – 28 March 1985) was a Russian-French artist of Belarusian Jewish origin. An early modernist, he was associated with several major artistic styles and created works in virtually every artistic format, including painting, book illustrations, stained glass, stage sets, ceramic, tapestries and fine art prints. 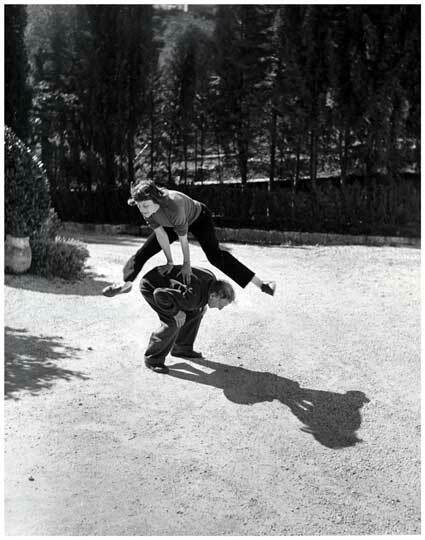 Wife Valentina jumping over the playful Chagall. 14" x 11" original silver print with Halsman's stamp on the reverse. No date.